NY1 is a New York, New York cable television station. The only TV station to pick up the VNR was NY1, the 24-hour cable news network owned by Time Warner. The reporter: Valarie D'Elia. In her weekly "Travel With Val" segment, D'Elia adapted the VNR into a live studio report, replacing the audio narrative of D S Simon publicist Tommy Mann, changing the order of client plugs, and removing her own recorded soundbites. Edited into the feature was online and phone contact information to learn more about Sandals Resorts, Viking River Cruises and Air Tahiti Nui. At no point during the broadcast did D'Elia or NY1 anchor Lewis Dodley reveal that the entire story was funded and furnished by the very three companies being profiled, or that D'Elia was a paid participant in the promotional materials of those same companies. One can only assume that D'Elia isn't too concerned about hiding her conflict of interest, since she offers VNR services on her own website. More than half of the NY1 segment came from the American College of Physicians VNR, including a soundbite from the study's lead author, Dr. Michael Shlipak. He linked results from the kidney test to patients' susceptibility to heart disease, heart attacks and strokes. In addition to including Kleiner's independent assessment, NY1 disclosed the VNR to its viewers—sort of. Most of the aired segment came from the VNR, but an on-screen label reading "Amer. Coll. of Physicians" only appeared briefly in the opening frames. Given the ambiguous and fleeting nature of this disclosure, viewers—if they noticed the label at all—likely assumed that just a few seconds of footage came from an outside source. No reasonable person (who didn't have access to the original VNR) would conclude that the majority of the segment actually came from a PR firm. 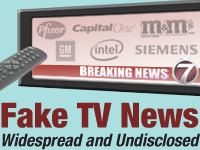 Diane Farsetta and Daniel Price, "Fake TV News: Widespread and Undisclosed A multimedia report on television newsrooms' use of material provided by PR firms on behalf of paying clients," Center for Media and Democracy, April 6, 2006. Diane Farsetta and Daniel Price, "Still Not the News: Stations Overwhelmingly Fail to Disclose VNRs A follow-up multimedia report on television newsrooms' continuing use of fake news provided by PR firms," Center for Media and Democracy, November 14, 2006. This page was last edited on 11 October 2017, at 20:33.